Open-source technology proves that democratizing access accelerates innovation, and bringing that same transparency and freedom to the development of autonomous vehicles is essential to its widespread adoption. 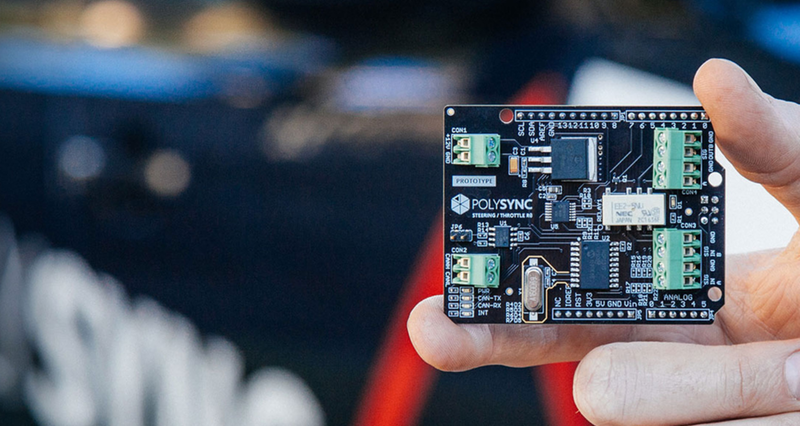 As a first step towards creating a more open automotive industry, PolySync announces the Open Source Car Control (OSCC) project, a complete, open-source kit for autonomous vehicle development. Debuting today at AutoMobility LA, PolySync OSCC enables engineers to build their own self-driving development vehicle using existing by-wire technologies on the 2014-or-later Kia Soul. While the cost of comparable hardware and software can be upwards of $100,000 and is limited to closed, proprietary systems (i.e. “black boxed”), OSCC is launching on GitHub and can be integrated into a new or used vehicle for less than $1,000. “Just getting on the road is one of the biggest hurdles in the development of self-driving cars,” says PolySync CEO Josh Hartung. “By lowering the barrier of entry we’re enabling developers to safely capture data and test models at a scale that just wasn’t possible a year ago. For the cost of a typical development vehicle today, engineers can be working on 10 OSCC-enabled vehicles tomorrow.” The OSCC project began as an internal initiative at PolySync to build safe, reliable, and inexpensive development vehicles. By open-sourcing the system, PolySync is encouraging others to modify and develop OSCC to meet their needs. The system allows developers to connect the Arduino-based OSCC modules, along with their own hardware and software, to the vehicle’s internal control systems, including the Controller Area Network (CAN). This enables communication to the steering and throttle controls, using either the PolySync Core platform or other software. Braking is enabled with the addition of a commonly-available, repurposed automotive brake-by-wire module. PolySync chose the Kia Soul as the initial OSCC vehicle platform for its combination of affordability and steering- and throttle-by-wire systems. In coming months, the company will be testing the system for compatibility on the Soul EV and other Kia models, and encourages the development community to help extend OSCC to other brands and models. “Theoretically, it should work on almost any modern car with electronic power steering, throttle-by-wire, and standard hydraulic brakes,” says Hartung. PolySync is launching a GitHub repo with details of the overall system, including hardware sourcing and specs, schematics, wiring maps, OSCC module assembly, firmware installation, and vehicle integration. Simple control algorithms will be available, along with full access to future algorithms and board designs when testing is complete. PolySync will make a limited number of OSCC hardware kits available and pre-orders will be available on GitHub. The OSCC kit is intended for R&D and off-road use only. The University of Michigan’s Mobility Transformation Center is the project’s first customer and will install the OSCC kit on two Kia Souls. The vehicles will be open test beds to support student education, and to enable academic and industry researchers to rapidly test connected, automated and driverless technologies in the real-world conditions of U-M’s Mcity, an urban-suburban environment purpose-built for testing advanced mobility vehicles. “We hope the OSCC project will help democratize the development of self-driving cars,” says Hartung. “Autonomous technology has massive potential, and the only way to push it forward is to enable everyone to have access to the tools they need to contribute.” A PolySync OSCC-equipped Kia Soul will be available for demonstration rides at AutoMobility LA, November 15th - 17th, at the Los Angeles Convention Center.